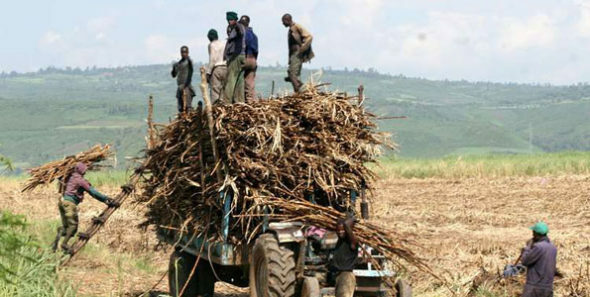 Kakamega Governor Wycliffe Oparanya has urged the national government to pay sugarcane farmers, saying it will encourage many farmers who had halted sugarcane farming due to non-payment to resume the farming. Speaking at Kilimo House on Wednesday after the formation of the task force set to address reforms in the sugar sector, Oparanya said they don’t have to wait for the task force to finish its report and the Agriculture Ministry can start paying sugarcane farmers, “As you are doing for maize farmers, you should do the same for sugarcane farmers,” he said. The sugar task force co-chair said the leaders from the Lake Region Economic Bloc (LREB) have taken the revival of the sugar sector as a priority and have held several meetings with the millers and representatives of the farmers, “So we actually know where the problem is,” he affirmed. Oparanya said President Uhuru Kenyatta said Kshs 2.6 billion should be given to the sugarcane farmers, and that it should be promptly made available by the Treasury. Furthermore, Opranya urged those chosen in the 14-member task force to be committed, to ensure they deliver a bankable document within 30 days.